CrossfFit Games: 1st place in Masters 40-44 age category 2017 and 2016 Pacific Regionals: 8th 2017, 11th 2016 as an individual. 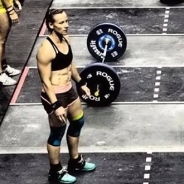 2015 competed with Team Range of Motion and placed 9th I started Crossfit in 2014 and have trained out of Range of Motion under the guidance of my coach Dan Williams since then. I am a mum of 2 girls and work part time as a physiotherapist.